Ottorino Respighi (1879- 1936) occupies a special place amongst the Italian composers that rose between the two World Wars. An individual synthesis of romanticism, impressionism and Italian neo-classicism gave his music unique distinguishing features. It was not just a superficial stylistic imitation of the musical language of the classical and baroque ages but a deep penetration into musical forms, themes and methods of composition. Alexei Skavronsky was born in 1931. He took lessons of music from professor Savshinsky in Leningrad and later from professor Ginzburg who was an outstanding pianist and teacher at the Moscow Conservatoire. In 1957 Skavronsky won the first prize at the International Smetana Competition in Prague. Since then he gives recitals and plays at concerts all over the world presenting very extensive and diverse repertoire. 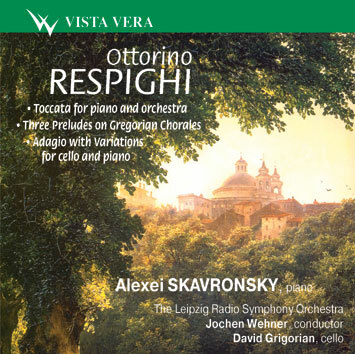 Both musical critics and listeners noted in particular his interpretation of complicated and rarely played works by an Italian composer Ottolini Resphigi.